The James family of Grosmont, Monmouthshire, Wales date back to the 17th century (at least). Grosmont is near the Herefordshire border and was Welsh-speaking until the end of the 18th century, according to Bradney. There was a transition from the old Welsh patronymic system to the use of fixed surnames in the 16th and 17th centuries and there are gaps in the parish records in the 17th century. This makes it difficult to identify family relationships in that period. Solicitors' records (see notes) refer to a Philip James and a William James having lands in Grosmont in 1688 and a Thomas James having tenancy of a house in 1714. Micah James (baptised October 6 1727) - possibly a mistranscription of Micall, an early form of Michael. A Micah Jones of Peterstone was buried at Rockfield, Monmouthshire in 1801. John James' Will of 1772 does not name William but does refer to a daughter Elizabeth James. He left a property in Grosmont occupied by a John Lewis to his daughter Anne. His goods and chattels went to her brothers John and Walter. Elizabeth and Micah or Michael received five shillings each. Grosmont Church Wall Plaque - "In memory of Ann ye wife of Jn James, who died Jan the 5th 1771 Aged 76. 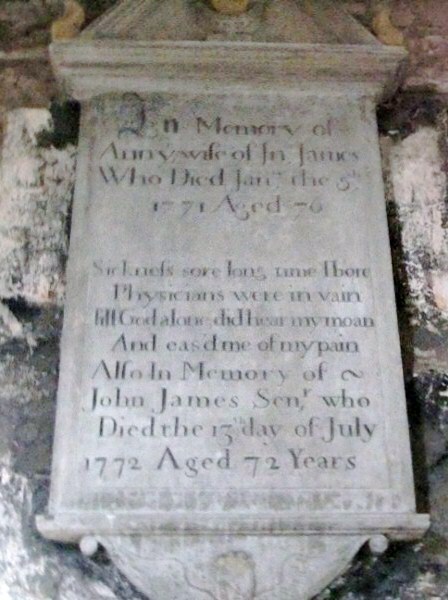 Also in memory of John James, Sen, who Died the 13th day of July 1772 Aged 72 years." A longer (and different) list of children can be identified from Llandenny parish baptisms - children of Thomas and Angelina - and burials: Thomas Herbert (1827-1827), Jane Herbert (1828- ), Sarah Herbert (1830- ), Jane Herbert (1830- ), Phillip Herbert (1830-1845), Arabella Herbert (1837-1903 d. Cardiff), George Daniel Herbert (1840-1847?) and John William Herbert (1840-1840). In the 1841 census the following were with Philip and Ann Lloyd in Llandenny: Sarah (15), Ann (8), Arabella (6), George (9mo). In 1851 with widow Ann Lloyd: Ann (17), Arabella (15) and James (12). KEEPING OPEN AFTER HOURS. - Edward Evans was summoned for keeping open his house, the Parrot Hotel, for the sale of liquor, during prohibited hours on Saturday night.-P.C. Longville said at half-past eleven on Saturday night he saw a woman with a jug in her hand knocking at the front door. The door opened, five or six men came out, and the woman went in. In about two minutes the woman came out with the jug full of beer, and she was followed by five or six more persons who looked like performers. Mr. Evans came to the door with them and closed it. -Defendant said he did not know anything about it he did not see the woman, and he could not find out who served her.-The policeman said Mr. Evans was on the doorstep close behind the woman.-The magistrates said professional singers had no more right in the house after hours than any one else. -Defendant they were his servants. -The Clerk: It is the case of the woman with the beer we have to consider. -No complaint was made of any disorderly proceedings, and this being a first offence defendant was fined in a mitigated penalty of 20s. and costs. The magistrates directed that the conviction should not be recorded on the license. (Monmouthshire Merlin July 31 1874). Arabella Herbert married Sydney Morgan (c.1830-1866) in 1856, Newport District June Q and subsequently William Smart (b. Staffordshire 1834-1903 d. Newport, Mon. ) in 1870. She had Thomas Herbert (?-1866), Sydney Morgan (1857- ), Arabella Morgan (1859- ) and Millicent Sarah Morgan and then Thomas Smart (1871- ), Henrietta Smart (1874- ) and James Herbert Smart (1879- ). Ann(e) Herbert (1833-1903) married Frederick Dixon Barfoot (1828-1906 ) at St Woolos, Monmouth on April 12 1856. One of the witnesses was Arabella Morgan. Coal merchant Frederick Barfoot appears in the London Gazette in 1863 and 1869 in connection with bancruptcy proceedings and discharge. They had children including Arabella Mary Barfoot (1856-1933, d. Liverpool) who married Publican Nicholas Burnell Jones (b. Newport 1856-1918 d. Birkenhead) 4 children including Olive Jones (1878- ), Nicholas Frederick Jones (1879- ) and Irene Jones (1890- ); Frederick William Barfoot (1858- ). Henry James (1806- ). In 1861 he was at Trebinshwn Farm, Llangasty Tal-y-llyn, Breconshire with wife Elizabeth ? (54) born Tylachdu, son Henry James (31) born Tylachdu, daughter Keziah James (29) born Llancilo, Mon., son Thomas James (22) born Goetre, Mon. and daughter Anne Selina James (13) born Llangorse, Brecknock. He was a visitor at Town Farm in 1871 described as a widowed farmer of 112 acres employing 2 labourers. Sabina James (1811-1873). Given a Catholic baptism on April 13 1817. She married John Phillips in a Roman Catholic ceremony in 1837. He was a butcher born in Rowlstone, Herefordshire. They had Elizabeth Phillips (1842- ), Sarah Phillips (1848-), Mary Ann Phillips (1851-1908) in Grosmont. In the 1861 census they were farming in Llangorse, Breconshire. In the 1871 census widow Salina (sic) Phillips was Innkeeper of the Noah's Ark, Skinner Street, Newport with daughters Polly (Mary Ann) and Sarah Price (married to cabman Edward Price (b. Gloucester 1845- ). Mary Ann married builder Alfred Williams (b. Newport 1850-1883) in 1874 and had Gertrude Annie Williams (b. Newport 1878- ). DEATH OF MR ALFRED WILLIAMS.-The death of Mr Alfred Williams, youngest son of Mr William Williams, who formerly carried on an extensive building business in Dock-street, Newport, took place at his residence, Park-street, on Monday morning. Deceased, who had been suffering from consumption, was about thirty years of age. (County Observer and Monmouthshire Central Advertiser March 3 1883). DEATH OF A YOUNG TRADESMAN.-On Tuesday morning Mr. Alfred Williams, builder, Park-street, died of consumption after a lingering illness, aged about 30 years. He was a son of the late Mr. W. Williams, builder, who carried on business many years in Dock-street (Weekly Mail March 3 1883). MRS. M. A. WILLIAMS, NEWPORT Mrs. Mary Ann Williams, of 16, Park-street, Newport, who died on January 21. left estate ralued at £739, and probate of her will has been granted to Mr. Henry Duckham, of Gaer Fach, Newport. (Weekly Mail April 4 1908). Gertrude (styling herself as Gertrude Elizabeth Williams) was at a renumbered/named 29 Park Square in the 1911 census with 60-year-old widow Eliza Murphy. Edwin James (baptised April 23 1817, Parish Church and Catholic - ). Edwin married Harriette Holmes (born Clifton, Bristol in 1827). They had John James (b. Pontypool, Mon. c.1854- ), George James (1856- ), Walter James (1859- ), Fanny James (b. Lancashire 1863- ) and Harriette Jane James (b. Newport, Mon. 1869- ). John married Hannah Greenwood (b.Tintern, Mon. 1858- ) in Newport in 1881. They had Margaret James ('Maggie') (1883- ), Edith James (1889- ) and another who died in infancy. Henry James (1771-1787) - born Feb 13 1771 and died July 1787 accordng to a family Bible. THAT well-bred CART HORSE, the property of WALTER JAMES, Geig, near Grosmont, Monmouthshire. He was got by Old Favourite, the property of Mr. William Jones, Llanthewey, and dam the property of Mr. Hill, Abbey Dore, she was got by Sweet William. Christiana James (b. Dec 18 1829). Christened in Parish Church and also Roman Catholic on January 17 1830. Unmarried with parents in 1861. George James (born Mar 10 1832). With his parents in 1871. In 1881 he was a farm bailiff in Peterstow, Herefordshire with wife Sarah ? (1847- , born Kentchurch, Herefordshire) and children George James (1874- , born Kentchurch) and Alfred James (1880- , born Peterstow). In 1891 he was farming at Grange Farm, Kentchurch. In 1901 widow Sarah James was keeping the Red Lion Inn, Grosmont with son Alfred, the licence having been transferred from a Lewis Jones to George James in 1900. The licence was subsequently transferred from Alfred to a David Strachan in June 1903. In 1911 Alfred was a threshing machine proprietor at the Greig, Grosmont having married Sarah Ann Sayce (1884- , born Grosmont) in 1902 (when his father was deceased) and and had 5 children born in Llanvetherine: Gerty James (1903- ), Kate James (1905- ), Alfred James (1906- ), Ellen James (1908- ), Daisy James (1910- ). Henry James (b. June 17 1835). Unmarried with brother George in 1891. May have been a witness to Alfred's marriage in 1902. John James (b.1838) who married Harriet Kezia Beavan (1844-18 Nov 1919, born Callow, Herefordshire, died Yorkley, Gloucestershire). In the 1911 census they were living with daughter Emily James (b.1870, Orcop, Herefordshire) and husband Edwin William Sims (b. 1865, Garway, Herefordshire) having been married 43 years and had 4 children of whom 2 had died. Emily and Edwin had Sydney George Sims (1894-1971), Hilda Bessie Sims (1901-1976) and Mary E Sims (c.1908) all born West Dean, Gloucestershire. John and Harriet's other surviving child was John Bartholomew James (24 August 1880-13 February 1949) who married Eliza Bowen (19 August 1880-20 February 1960, born Llangattock, Monmouthshire) and had: Edna May James (31 March 1905-1979) who married Richard Thomas Latham (8 December 1900-1971) in 1941; Leonard John James (19 June 1906-1986) who became a Superintendent in the Monmouthshire Constabulary; Gladys Emily James (b. 1907); Marjorie James (b.1909); Annie Elizabeth James (5 February 1912- 15 November 1990) who married George Sydney Brunt (1918- 28 July 1992) born Neath, Glamorgan; George David James (31 October 1919 - ) who probably married Nora J Martin. All were born in St Maughans, Monmouthshire. In the 1939 Register John B. of the Green Farm is described as being disabled on the right side by a stroke and Eliza as being crippled for many years. Alfred James (b. May 16 1841). A draper's apprentice in Hereford in 1861; a 'shop man' at 21 Hare Street, Woolwich in 1871. Mary James (c.1818-1902, died Tuam, Galway, Ireland) who married Irish surveyor Patrick McCormick (c.1814-1902, died Tuam, Galway, Ireland) at Grosmont on October 27 1841. They had: Frances McCormick (1843- ),; Mary McCormick (1845-1919, died Tuam, Galway, Ireland); Thomas McCormick (1850-1913, died Tuam, Galway, Ireland); John Joseph McCormick (1852-1910) a general practitioner who married Louisa Emily Stobart (29 September 1863 - ) born Chelsea, London, in 1885; Anne McCormick (1853-); Patrick William McCormick (1855- ); Jane McCormick (1857- ) unmarried with brother Charles in 1911; Frank or Francis McCormick (1860-1933, died Tuam, Galway, Ireland); Charles Vincent McCormick (8 December 1863- ) a medical practitioner, unmarried with sister Jane in Bootle, Lancashire in 1911 and widowed in Penmaenmawr, Caernarfonshire in 1939. William James (bap. 9 Mar 1823 - ). A tailor's apprentice to Philip Sparks at Rose Cottage, Grosmont in 1841. Then a tailor in Usk Road, Raglan in 1851 married to Mary ? (1823- ) born Hereford with children Sarah James (1849- ) and Thomas William James (1850- ). In 1861 he was a visitor with his sister Mary and the McCormick family in Grosmont. Meanwhile in 1861, Mary was at Lewellyn Cottage, Llantilio Crosseny with additional children Isabella James (1852- ), Henry James (1853- ) and Mary Ann James (1858 - ) all born in Raglan.. In 1871 William was a farmer of 5 acres at Middle Pant, Llantilo Crosseny with wife Mary, sons Thomas (a waggoner), ag lab Henry and daughter Mary Ann. Walter James (1775-1854) - baptised 18 November 1775 (born Nov 12 1775 accordng to a family Bible). Mary James (1778- ) - baptised 11 February 1778 (born May 7 1778 accordng to a family Bible). Married Samuel Dykes (otherwise Samuel Dyke, c.1781-1860) of Crickhowell in the Parish Church, Grosmont and in a Roman Catholic marriage on December 17 1812. Anne Abigail James (1780-1783) - baptised 20 May 1780 (born April 24 1780 accordng to a family Bible). George James (1785-1810) - baptised 14 August 1785, when Henry was described as a mason (George born Feb 20 1785 accordng to a family Bible). He married Christiana Higley in 1809. 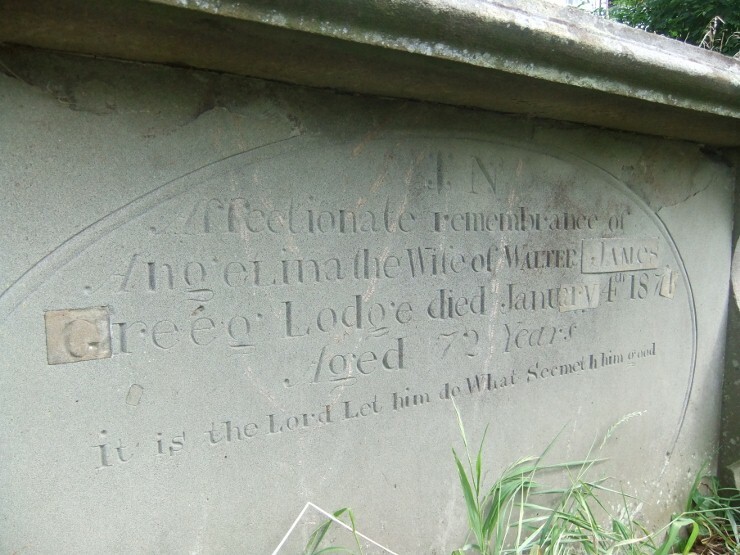 A George James aged 24 was buried 8th February 1810. 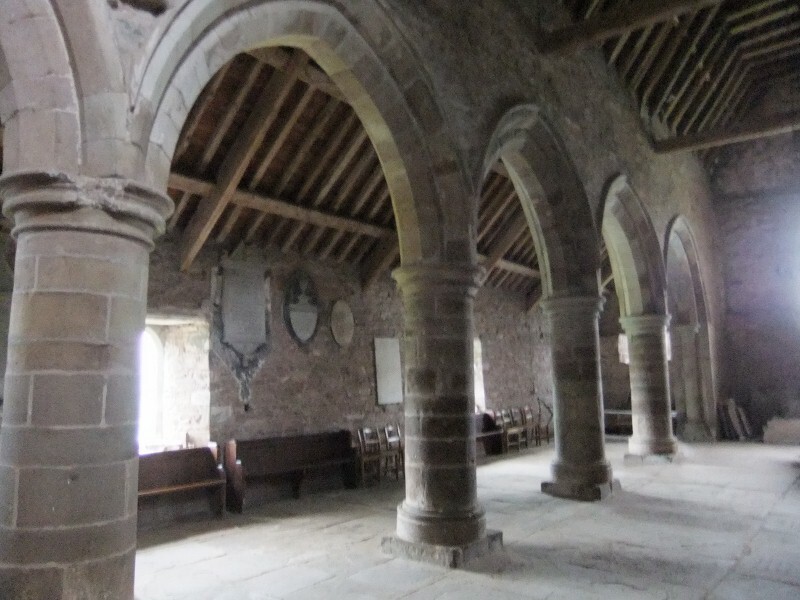 Subsequently Christiana James (widow) married Charles Price (widower) of Crickhowell in Grosmont on June 23 1812 - both in the parish church and a Roman Catholic marriage. There had also been a Catholic baptism in 1785 and a Roman Catholic wedding with George James. John James (1788-1869) was baptised (both Parish Church and Catholic) in Grosmont on May 26 1788 (born May 2 1788 accordng to a family Bible). John James was married in Grosmont 23 June 1819, otp, batch to Jane Edmonds (1791-1839), Skenfrith, spin witnessed by Wr James and Elizth James with consent. There was also a Roman Catholic marriage the same day. Jane Edmonds had been baptised in Skenfrith in 1792 as daughter of Charles Edmonds (1752-1829) and his wife Sarah Phillips (see Edmonds family in Skenfrith). Ann James (1746-1746) was baptised on 7 November and died on 14 November. William James (1746-1746) was baptised on 7 November and died on 21 November. 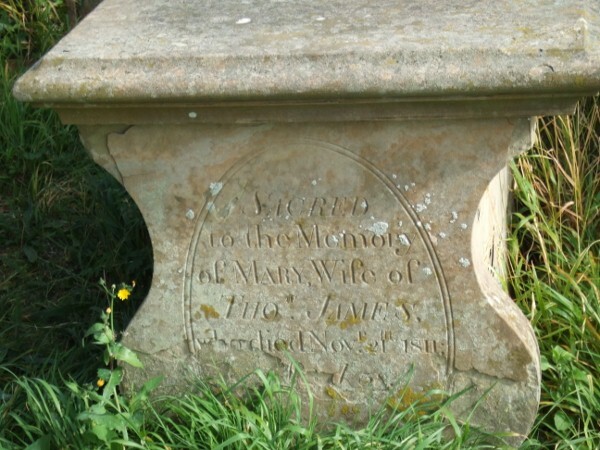 Richard James (baptised 5 Nov 1717 - buried 28 June 1801) who married Martha Evans (? - probably buried 7 August 1770) on 28 June 1752. They had Martha James (1754- ), Elizabeth James (1758-1835) and Ann James (1760-1762). On Monday the 27th ult. 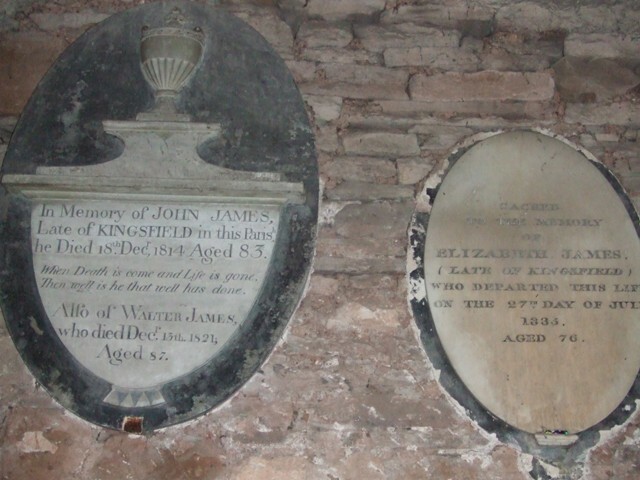 died, at Kingsfield, near Grosmont, Monmouthshire, Mrs James in the 70th year of her age; she was universally respected by her numerous friends, and her loss will be long felt by the neighbouring poor, to whom she was always a kind and steady friend. Qn Monday last, at Kingsfield, in the parish of Grosmont, in the 77th year of her age, Mrs. Elizabeth James most sincerely regretted by the whole neighbourhood, more than 200 of whom, to testify their respect for the deceased, followed her remains to the grave. DEATHS - Qn Monday last, at Kingsfield, in the parish of Grosmont, after a protracted illness which she bore with Christian fortitude and resignation, Mrs. Elizabeth James, in the 78th year of her age. She lived respected by the rich, to whom she was always courteous, affable and obliging; beloved by the poor, to whom she was a constant, judicious and liberal benefactress and her death will long be a subject of deep regret to all her relatives, friends and neighbours. These names and ages correspond with a family listed at Mansion, Grosmont in 1841 without mother Jane (buried 4 February 1839, aged 48), daughters Mary (buried 30 September 1837, aged 16), Sabina (buried 9 December 1837, aged 9) and Louisa (buried 16 January 1841) but including a Walter James with a rounded age of 65, 'Independent' (John's brother). Walter was buried on 10 March 1854, aged 79, opt, Coroner's Order. In his will, his estate was left in trust to John James and subsequently to Sarah and Isabella Abigail. Ann James appears in the 1851 census but not in Walter's will, suggesting that she had died by 1854. Jane Price received a hundred pounds (after her father's death) for her own - not her husband's - use. Isabella Abigail Nicholas was brought back to Grosmont from Broad St, Hereford for burial 20th October 1864 aged 32 having married Thomas Black Nicholas, draper, on the 7th April. John James died in Grosmont on 16 October 1869 and was buried on 20 October 1869, aged 81. Sara James was still in Grosmont in 1871. A Sarah James of Brecon Road, Abergavenny aged 47 died in August 1878 (needs checking). On Tuesday last, an inquest was held at our county prison, on view of the body of Ruth Harry, a female prisoner who died in child-bed, on Sunday the 8th instant. After an investigation of all the circumstances of the case, the jury returned a verdict of "Natural Death." The deceased, who was only 19 years old, was convicted at the last October Sessions for this county, on a charge of stealing a gown belonging to the daughter of her master, John James, of the parish of Grosmont, and sentenced to twelve months' imprisonment. hogsheads and casks in good condition, with sundry other articles. Sale to commence precisely at Eleven o'clock. famous for its trout fishing. Prime Pasture Orcharding in full bearing. Kingsfield takes its name from being the place where King Henry III encamped when he was attacked and defeated by Hubert de Burgh in 1232. In the eighteenth and early part of the nineteenth century this place belonged to a family named James, who seemed to have been an old family in Grosmont. It was sold to Colonel Scudamore about 1860. The same family also owned Trevyr, the Grug Lodge, and the Town Farm. The Town Farm, so called because of its situation at the edge of the town, also belongs to Mrs Gazzard. At the end of the eighteenth century it belonged to William Roberts James, who in 1806, then residing in Serle Street, Lincoln's Inn Fields, married Maria Hodges. He died in 1850 at Lested Lodge, near Sutton Vallance, Kent, having had issue Maria, William, Eliza, Amelia, Helen, Robert Edwards, Henry Brandram, Thomas Lloyd, and Edward Wallwyn. The house is a very old one, some of it having been apparently built in the early part of the sixteenth century. Over the door is the date 1673, and on the door-frame of the stable 1671. (pp. 52-53) Town Farm, Grosmont, a fine little house of (...) three-in-two plan (...) is developed from its neighbour, Upper Tresseny (...) for it has the principal entry at the side. (...) Of two storeys, with attic, it is completely unaltered, with original doors, windows, and cupboards throughout. [Footnote states: Part of the back wall of the parlour, beside the farm-yard, fell in 1952.] These windows have the usual angled hoods; they are of four lights, ovolo-moulded, on both floors: the lights are 12 in, wide with intermediate bars. The joists have bull-nose mouldings. (...) the entrance is central, and the whole layout symmetrical. Entering the lobby, a striking and novel feature in our tradition, the stairs to the cellar are opposite; beyond is the pantry; doorways with shaped heads on either side lead to rooms, hall, and parlour, approximately equal in size and similar in character, each with its stairway, to a bedroom above. The house is dated on the outer, rectangular, door head - 1673. The back doorway has a modern frame, but may be original. A stable, dated 1671, is on the opposite side of the road; its chamfered door frame and door are original, as are the decorative "trident" hinge-straps: the tall window beside the door, of seven lights, has diamond mullions. This door and window unit, under the same angled hood, is seen at the house as well as the stable; it is in our experience peculiar to the parish. It enabled the seventeenth century indwellers, man or horse, to have a peep at a visitor. In the marriage settlement of Thomas Edwards and Sarah Delahay, reference to tenements, etc in the parishes of Skenfreth and Grosmont near 'the lands late of Phillip James, of William James, of Jane Phillips, widow of Isaack Williams gent. Similar 6 September 1718. Similar 4 May 1713 - all described as 'late of'. (Both filed under parish of Skenfrith). Conveyance. Lease for a year with 4 names including William Edmonds of Skenfreth, farmer (filed under Skenfith). Charles James gent tenant (with two others) recovery of property, land in Grosmont. Monmouthshire Merlin 20 September 1834, part of an item on erection of toll gates within the Abergavenny Diistrict of Turnpike Roads: "A Toll Gate or Bar, across the turnpike road from Abergavenny to Hereford, by the Greege, between a close of land in the occupation of James Jones, and a close of land in the occupation of Walter James, in the parish of Grosmont." Monmouthshire Merlin 12 September 1851, leading on from a fire in Llanfoist: "(...) The accident arose from the culpable conduct of the parents of some of the village children, allowing them to have access to their lucifer match boxes. A fire took place last week in Grosmont, from the same cause, when Mr. M'Cormack's barn was destroyed, and about sixty bushels of wheat. Surely there is a law in existence that will reach parents who are so careless as to leave such dangerous articles as lucifer matches within the reach of children." This practical and accessible guide shows how to get the most from these seemingly complex records, including those scattered in church courts before central registration was introduced in 1858. This practical guide identifies the major websites and online sources of data available to family historians. It is ideal for both beginners and more experienced researchers as it explores the most useful sources and helps readers to navigate each one. A classic book on dating photographs. Probably the best book on dating photographs. Writing Your Family History helps family historians realize the full potential of the names, dates and facts that they have researched to compile a detailed family history that will be preserved for future generations.